When the Bandstand was moved from Central Plaza over to Adventureland and Magnolia Park, the Carnation Plaza Gardens were constructed and opened on August 18, 1956. A plethora of talent has performed under the tent of this area, including Artie Shaw, Benny Goodman, Harry James, The Osmond Brothers, Lionel Hampton, Tex Benecke, Cab Calloway, and Stan Kenton. 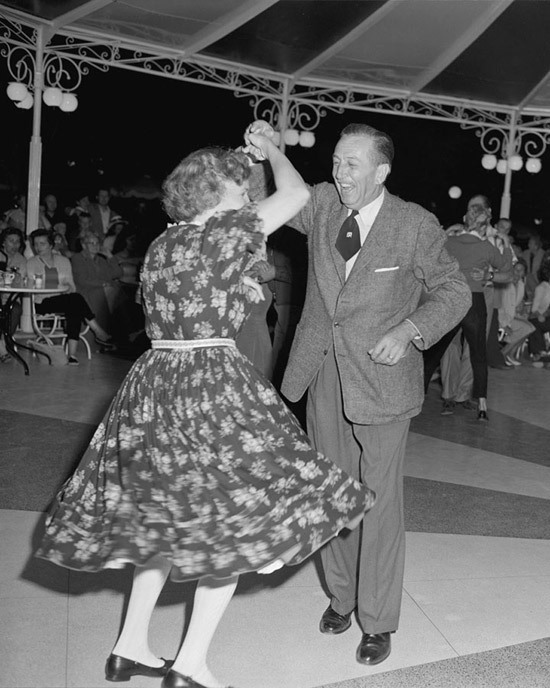 For those of you not so lucky to be from California, in Disneyland there was this place known as Carnation Plaza, which has been referred to as “The Longest Running Swing Dance Venue”. A notable part of the Southern California swing dance scene for years, case in point you can see California swing dance legend Hal Takier dancing to the song Avalon there in 1987. For a more comprehensive view, there is a small documentary on the topic of Carnation Plaza called “A Stage that Walt Built”. However, here is my personal attempt to give you a glimpse of what Carnation Plaza was and still means to Southern California. 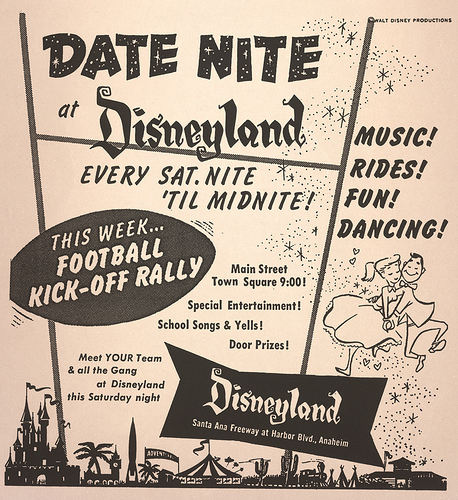 Beginning in 1957, Date Nights were a staple of Disneyland culture continuing almost until the 70s. Advertised in local newspapers they were claimed as a way to become a BMOD (Big Man On Dates). In 1967 for $6.50 in the United State one could get 10 rides and full admission to the park which included dancing. Entrance of Disneyland looks great, attendees not so dapper these days. As seen by the school yells, this was when the collegiate school spirit was part of Southern Californian culture. Music has always been an important part of the Disneyland experience, with the traditional Disneyland Band performing there since opening day. And while that band remains an essential element of the overall ambience of the park today, on June 28, 1957 things really got swinging! 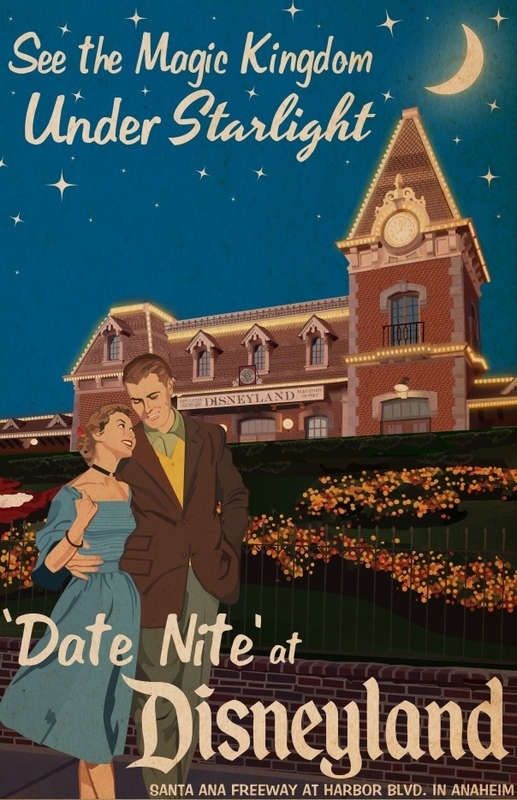 For the first time Disneyland would extend its operating hours until 1am on Friday and Saturday nights for Date Nite, in an attempt to attract young couples as a dating hot spot. Couples could purchase Date Nite discounted tickets which permitted admission only after 5pm. 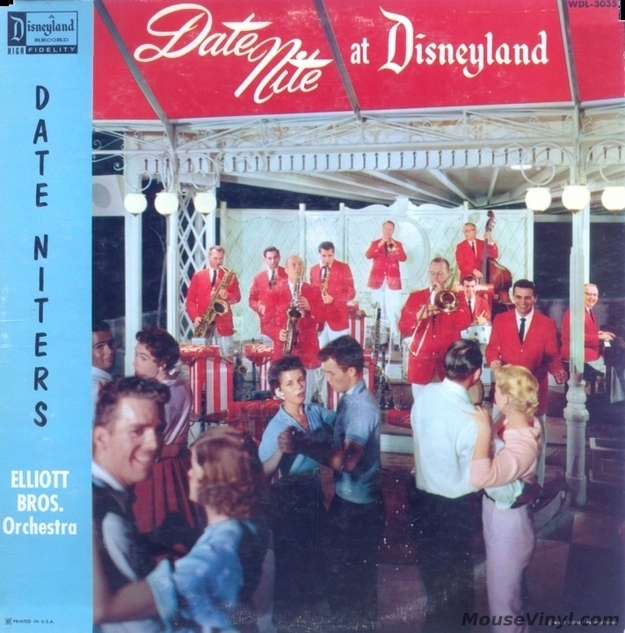 Carnation Plaza Gardens became the chosen central Date Nite location and the local Elliott Brothers band were brought in as the Date Niters who had the ability to perform everything from the slow dances to rock ‘n’ roll to the “La Raspa,” which became a Date Nite tradition. To give a better picture of what Carnation Plaza was about, here is an article from On Stage magazine, which features an interview with Stan Freese who booked professional swing bands for several years at Disneyland. At Disneyland’s Carnation Plaza Gardens, performers can stand in the footsteps of giants. Stan Freese calls the Carnation Plaza Gardens Stage his “home away from home.” That’s not too much of a stretch. Freese has been helping put on shows at the historic Disneyland venue since 1974. Today, he books the professional swing bands that fill the stage every Saturday night. The job never gets old, thanks in large part to Freese’s appreciation of the star-studded history of the stage, which opened in 1956. “This is the longest-running big band stage in the world,” he says, rattling off a list of the stars who have graced the venue over the years. The roster includes Cab Calloway, Bob Crosby, Jimmy Dorsey, Artie Shaw, Lionel Hampton, Les Brown, Buddy Rich, Woody Herman, Stan Kenton, Harry James, Eartha Kitt, and Benny Goodman–whose orchestra was the first big-name group to perform on the stage, back in 1961. The “castle,” of course, is the famous Sleeping Beauty Castle–the ultimate symbol of Disneyland fun and fantasy–and located “just a stone’s throw” from Carnation Plaza Gardens, as Freese puts it. The stage itself is about 20 feet wide and can accommodate 35 to 40 musicians; larger groups spread out onto the terrazzo dance floor. They perform for audiences of up to 150 people under a canopy of gold and burgundy, which adds to the festive atmosphere. Every spring Hahn brings two jazz ensembles to play at Carnation Plaza Gardens; in the fall, he brings a marching band to perform in the Disneyland parade. It’s more than history and fond memories that keep him coming back. In Hahn’s opinion, everything about the experience is top-notch. “It’s nothing short of the Disney standard,” he declares. The thrill has never worn off for Stan Freese, either. Born and raised in Minneapolis, he made his first trip to Disneyland at age 12, when he marched in the parade with his school band. “It was just great,” he recalls. “I had no clue I was going to work there.” A tuba player, he performed as a soloist in the Soviet Union in 1969. That led to his Disney job interview and his role as leader of the original Disneyland Band, starting in 1971. In Freese’s early days at Disneyland, the Carnation Plaza Gardens Stage was still bringing in national talent for its night-time big-band series. There also was a period in the 1970s and ’80s when pop acts like the Osmonds, the 5th Dimension and the Pointer Sisters played there. These days, the evening shows are performed mostly by swing bands that Freese books from Los Angeles, Orange County and as far away as San Francisco. Whether the performers are professionals or students, they enjoy first-class treatment. Buses come straight off the Santa Ana Freeway into the Disneyland back lot, where students and gear are unloaded. On the back lot, the students can avail themselves of the dressing and rehearsal facilities as they prepare for their big moment on the Carnation Plaza Gardens Stage. A little known fact about Walt Disney is that he was a fan of jazz. In fact in 1935, he produced an animated Disney short named Music Land, which attempted to bridge the gap between classical music and jazz. 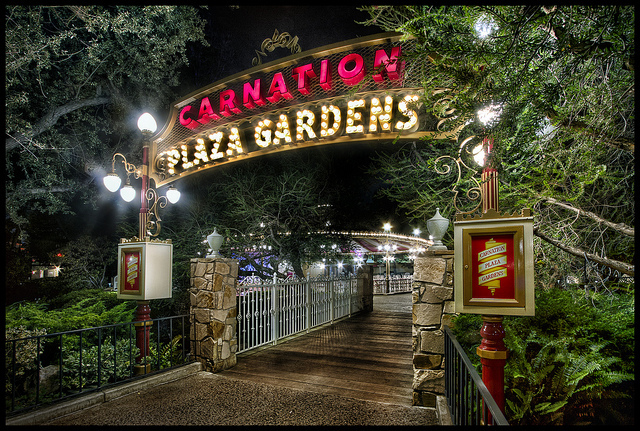 As a matter of fact, Walt himself was a patron of Carnation Plaza as well. 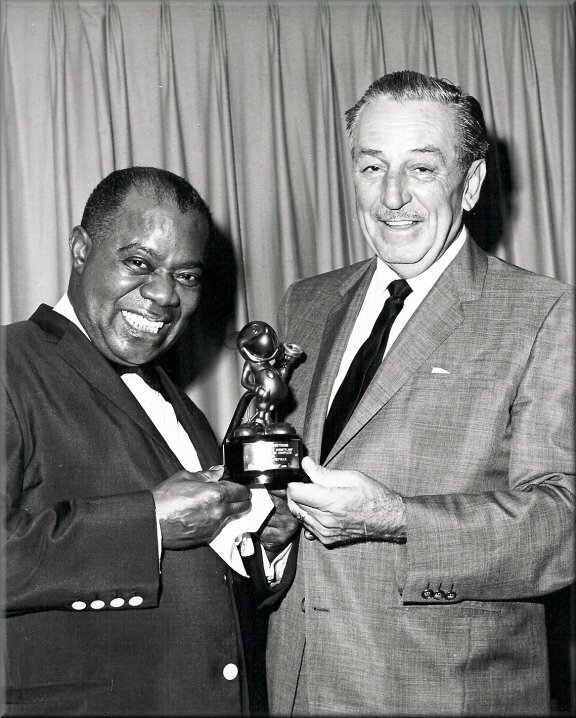 Besides supporting Jazz in different ways such as recordings, Disney was friends with many of the musicians who played at his park including Louis Armstrong.